Prayerfully journey through Lent with Michelle Francl-Donnay's fresh and meaningful reflections on the daily Mass readings. 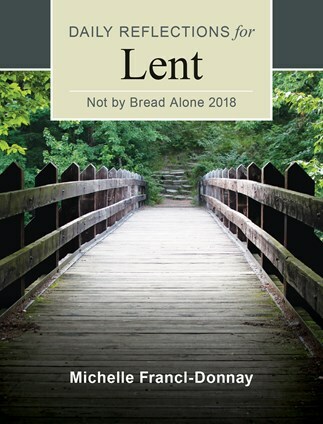 In just minutes per day, the insightful meditations of Not by Bread Alone can deepen your experience of this solemn season of prayer and penance and prepare you to participate more fully in the joy of the great Easter mystery. Michelle Francl-Donnay gives us the great gift of a devotional for Lent 2018 that can be used year after year. Because her reflections are simultaneously personal and universal, readers will easily identify with what Francl-Donnay offers for contemplation. Each entry includes a meditation with prompts to help readers explore daily readings, Scripture, and Francl-Donnay's reflection, as well as a prayer. Not by Bread Alone is a rich resource that stands out among devotionals. This book will touch mind, heart, and soul, paving the way to the glory of Easter. Michelle Francl-Donnay is a scientist, writer, teacher, wife, and mother. All of these life experiences are the leaven in Not by Bread Alone. That's why it rises above other books of Lenten reflections. Michelle has lived what she is talking about, laughed, cried, and prayed about it, and endeavors to understand its spiritual meaning. Here is nourishing food for the spiritual journey. What makes this booklet so effective is the thoughtful, fresh, and down-to-earth comments of its author, Michelle Francl-Donnay. Her reflections draw on rich experience and in so doing open the meaning of the Scriptures.